Products >> HDLT4-2-Headlight / Spotlight 4.5" Dia. HDLT4-2-Headlight / Spotlight 4.5" Dia. 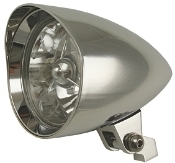 4.5" x 6.75" Chrome Aluminum Headlight/Spotlight Tri-bar with Visor. Suggested uses: As a Spotlight with our TLM Light bars or as a Dual Headlight with our DHM4.